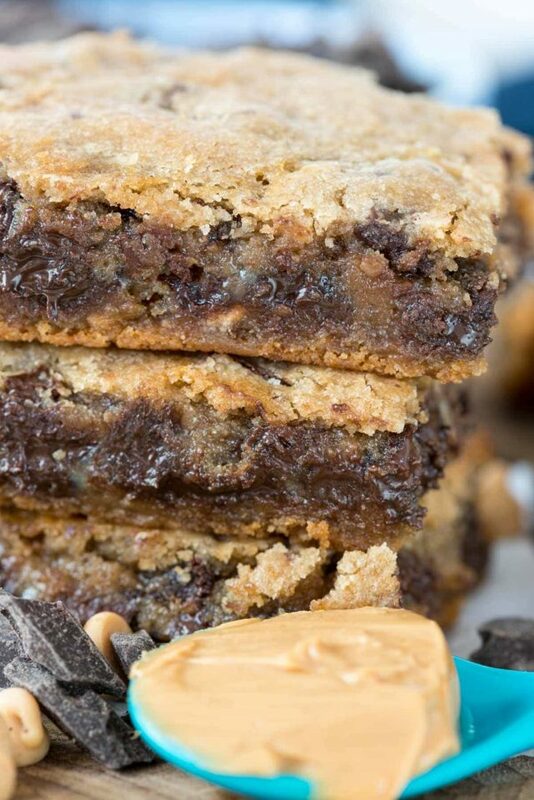 Gooey Peanut Butter Chocolate Chip Cookie Bars – An easy chocolate chip cookie bar stuffed with a gooey peanut butter mixture. This is such an easy recipe – it starts with prepared cookie dough and has only 4 total ingredients! EVERYONE loved them! Sometimes you just need an ooey gooey dessert, don’t you think? When I’m in that mood where I NEED indulgence, I almost always crave cookie bars and they must have chocolate and peanut butter. The gooier and chocolatier the better!! 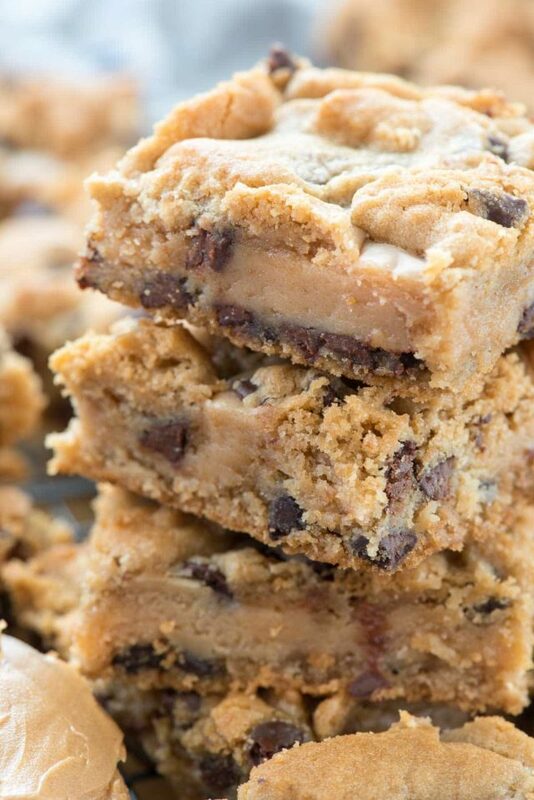 I think I’ve hit the jackpot with these cookie bars: they’re an easy cookie bar recipe and their filled with a gooey thick peanut butter layer and tons of chocolate. Everyone who tried one just raved about these bars and guess what? Mel didn’t just eat one…he ate several, earning these cookie gooey bars the Mel ate it tag. It’s fantasy football season again and last weekend we hosted his first draft party. (He does two leagues; the other one is in Arizona which he travels to every year for the draft.) I made these for the guys to eat and they were gone by the end of the day. 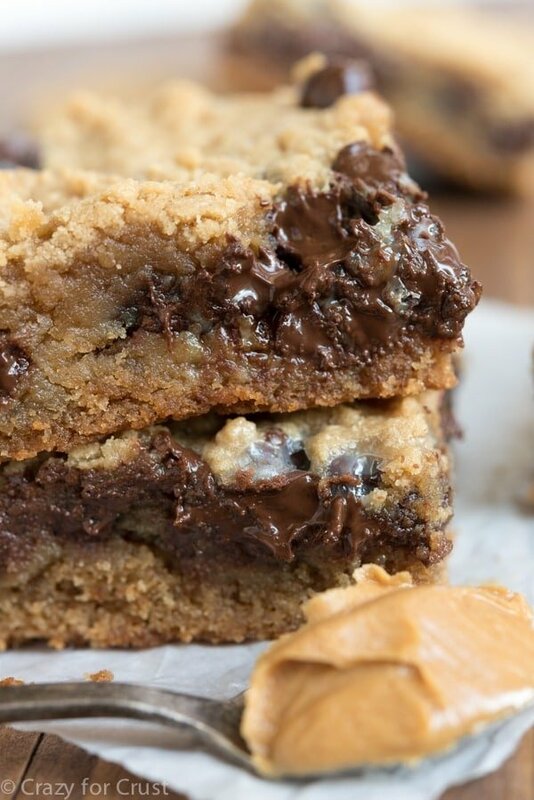 Gooey Peanut Butter Chocolate Chip Cookie Bars have only 4 ingredients and are the perfect indulgent bar cookie recipe filled with peanut butter and chocolate! I really wished I saved some of these bars because I could really have used them last week. I’ve gotten very little sleep and very little work done over the past 5 days because….WE GOT A PUPPY! Ginger has been gone about 5 months now and it was time to fill our house with the sound of a dog again. She came home with us last Tuesday and, at 8 weeks old, is a little bundle of energy. Within about 5 minutes she chose me as her person and she cannot stand to be separated from me…especially at night even though we are in the same room but she’s in her crate. Needless to say, it’s been a looooong few days and all I want to do is eat bad food and sleep but every time I sit down I have company. 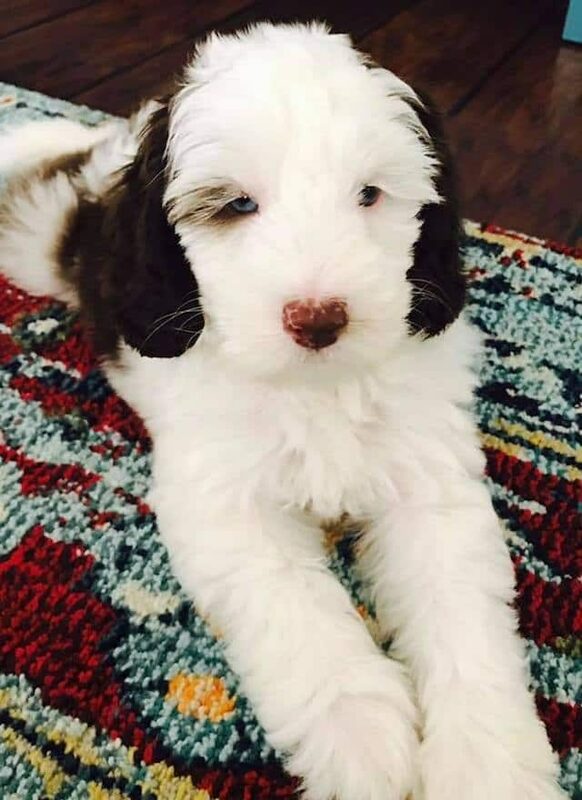 Our baby’s name is Abby Rose and she’s a Labradoodle. Want to see her picture? You know you do. That’s our little baby! I swear, it’s like having an infant all over again. It’s a good things she’s cute because it’s hard to get mad when she’s in hour 2 of barking all night. Here eyes are blue and we hope they don’t change, and her nose is mottled now but probably will fill in with age. I’ve never had a puppy before so everything is a new learning experience, from puppy teeth to bonding and crating to potty training. She’s the sweetest thing and we’re so lucky to have her in our furrever home. Now, back to the best ever cookie bars – ever. You know you clicked over for the puppy pic but you should print this recipe. EVERYONE raves about them! See that thick layer in the middle? It’s sweet and gooey peanut butter! I started with Pillsbury chocolate chip cookie dough. I used two rolls, one for the top and one for the bottom. If you prefer a homemade cookie, this recipe always works perfectly. You can also switch it up and use another flavor roll of cookie dough, or make your own sugar cookie or peanut butter cookie dough instead. The middle is a combination of peanut butter, sweetened condensed milk, and flour. You could leave the flour out but the layer won’t be as thick; it’ll bake into the bars. If you want a thick layer you need the flour for binding. These are best made for company so you don’t eat the entire pan! Gooey Peanut Butter Chocolate Chip Cookie Bars - An easy chocolate chip cookie bar stuffed with a gooey peanut butter mixture. This is such an easy recipe - it starts with prepared cookie dough and has only 4 total ingredients! Press one of the rolls of cookie dough into the bottom of the pan, creating a thin crust. Stir sweetened condensed milk, peanut butter, and flour in a small bowl. Spread over the top of the crust, leaving a small border around all edges. 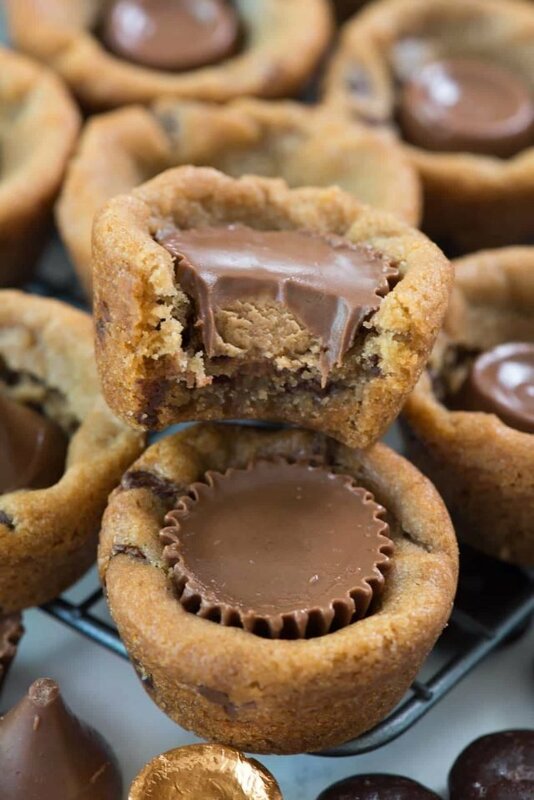 Crumble the remaining cookie dough roll and sprinkle evenly over the top of the peanut butter mixture. Lightly press with your hands to spread so that it’s mostly covered (some of the filling will show). Bake for 20-30 minutes or until the bars are golden brown on top with just a bit of “jiggle” in the center. Cool completely before slicing. Be sure to check out all my gooey bar recipes as well as Ritz Reese’s S’mores Bars by Oh Sweet Basil, Ooey Gooey Peanut Butter Brownies by Tried and Tasty, or Chocolate Peanut Butter Fudge Bars by Averie Cooks. These bars…they look epic! I would love one for breakfast! Thanks for the linky love! Now THAT’S a family get together worthy dessert! Abby Rose is absolutely adorable! And so fluffy! 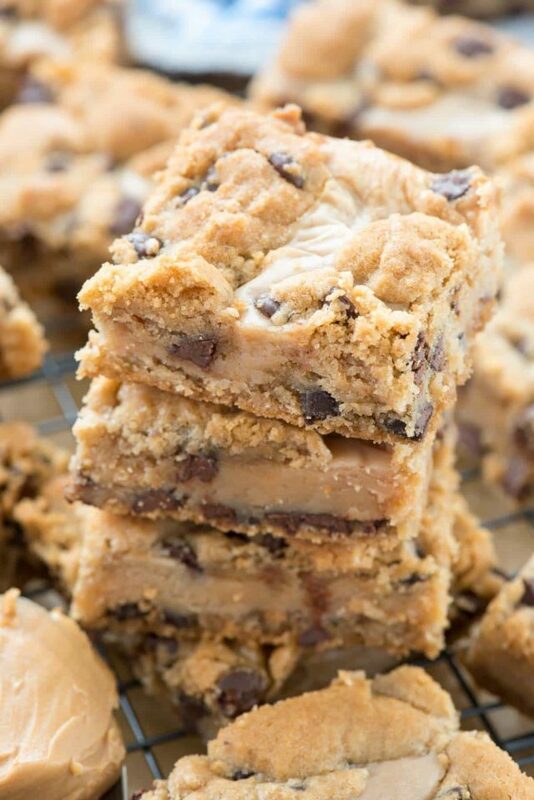 These cookie bars look so delicious! I need to make them soon! I usually never comment but I thought I would offer a suggestion with crate training the puppy at night. Our family has a labradoodle as well, aren’t they the cutest. When we brought her home I put her crate in a chair right by my side of the bed at night and when she would whine I would stick my fingers through the holes in the door just so she would know I was there and she would stop whining unless she had to use the bathroom. After a week we moved the chair back a little and then the next week farther and so on until the crate was on the floor in our walk in closet. She stopped whining at night the second night we had her at home and had no problems ever since. They are smart dogs and catch on quick! Best of luck with your new “baby”. Love these gooey bars and love Amanda’s idea about putting Abby’s crate on a chair next to the bed. Your bars to to die for delicious! Pretty dog! And the crate does need to be right next to the bed for a week or so, then move it away a few inches a night. Also, when she has sufficient shots – take her to a puppy party ( our vet hosted one) and puppy kindergarten. Early socialization is essential for calm walks later! I’m so craving those bars RIGHT now! What an absolute cutie little Abby is Dorothy. I used to volunteer at an organization that trains assistance dogs and they always seemed to have labradoodles around. They really are a great dog and remind me of living teddy bears. As far as these bars. . .they look absolutely incredible. It would be impossible for me to keep these around because I’d want to scarf down the entire batch in one sitting. hey girl- these bars look amazing! Congrats on your new puppy Abby Rose she is so cute! These sound yummy! Thanks for posting the recipe! By the way, your dog is adorable!! The puppy is adorable.. I too, lost my 17 year old Yorkie -Pekinese rescue about a year ago… I miss hearing her in the house and am now looking for either a Yorkie-Mix rescue or Pekinese Mix rescue pup..
as far as these bars go.. I’ll start with the original chocolate chip cookies but then I’m going to make a base of my peanut butter /fudge bar cookie dough.. Never too much peanut butter for me! I know these bars are wonderful, I’ve made something similar with a cream cheese filling…but peanut butter!! yes! Love your new baby-she’s beautiful!